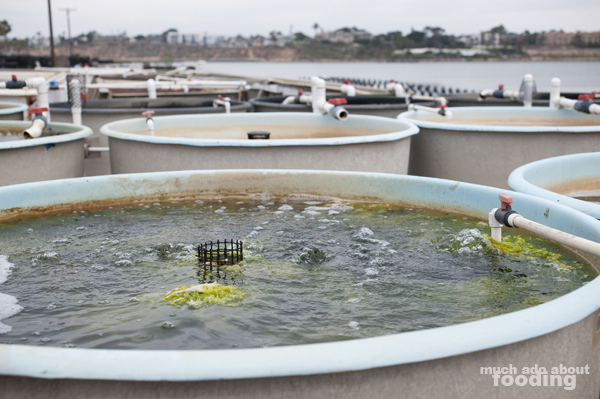 This post is Part III of a four-part series of articles about our visit to Carlsbad Aquafarm. We would like to thank Rebecca Richards & Link Mathewson for making this trip possible and Norman Abell for educating us on their methods of shellfish farming. We were curious to learn more about how their Luna oysters are sustainable after tasting some at Slapfish. What we uncovered was a complex and precise process dedicated to producing the best product possible. If you missed Parts I and/or II, you can find the first here and the second here. "Do you test the quality of the water monthly, daily, weekly...?" "The water's monitored from various places on the farm, and tested by a third-party lab, on a daily basis. We're looking for plankton blooms, also known as red tides - large concentrations of aquatic microorganisms - that may be harmful to humans, animals, and fish, resulting in PSP or paralytic shellfish poisoning. 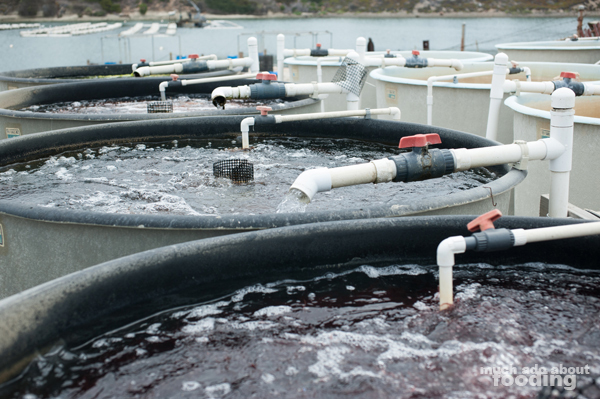 Yet because of the many regulatory steps we are required to go through as well as a highly developed testing and closure system, coupled with effective law enforcement and oversight, Carlsbad Aquafarm has a long history of successfully preventing consumers from being exposed to shellfish from areas closed because of red tide." 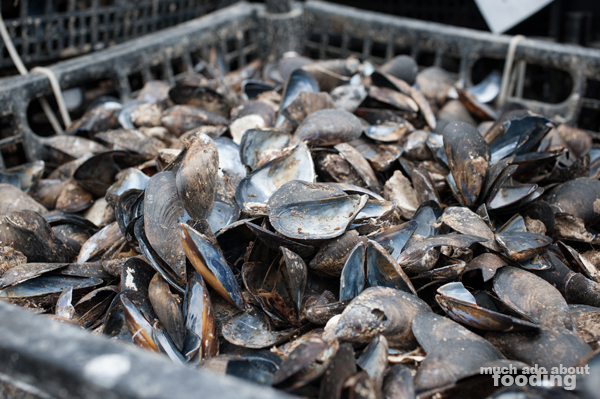 With mussels growing to market size and weight in the range of 9-15 months versus oysters' 12-16 months, it does make more commercial sense to produce more mussel. 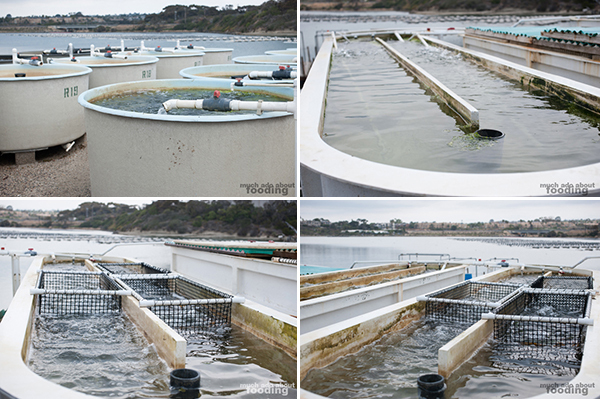 They are also growing the San Diego native green abalone as aforementioned, which are very slow growers, and they also produce tanks of seaweed. The most popular of their seaweed crops is for culinary usage though they do grow some for marine aquatic live-feed purposes. 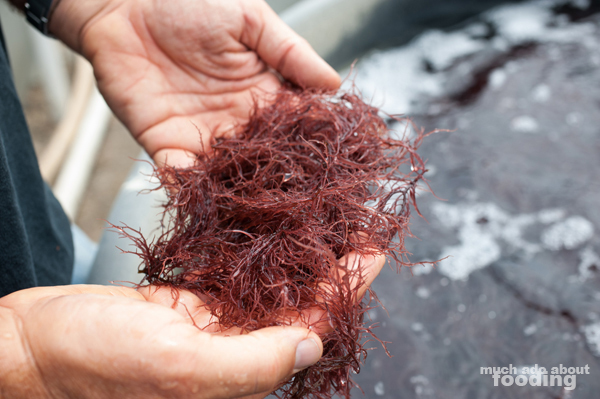 We took a look at their Red Ogo, a native species to our part of the coast with a crunchy texture. 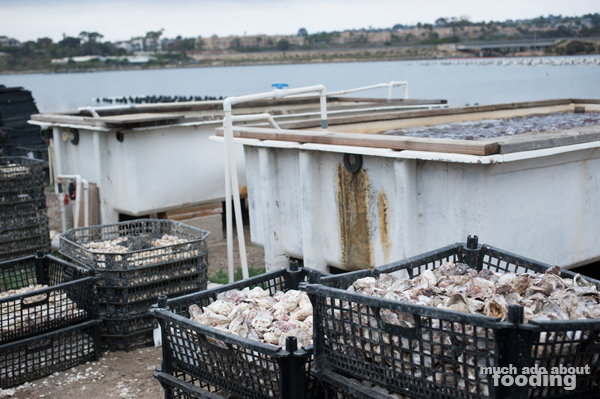 Originally grown to feed their abalone crop, it is now being sold to chefs. A major challenge they face (for) with these crops that are in tanks exposed to the air and sunlight is the invasion of weeds which they cannot kill as they don't use herbicides. 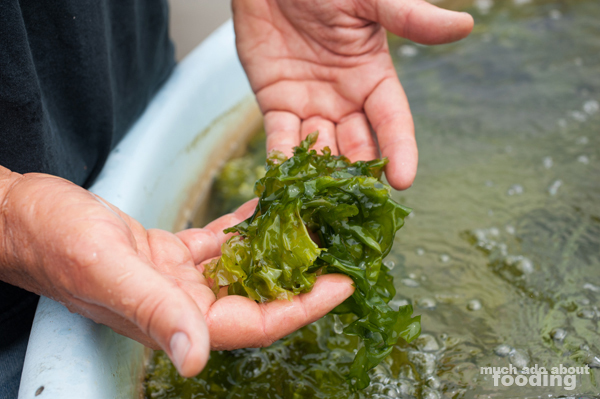 We appreciated learning that as well as the perspective that it makes more sense to grow this seaweed in mass amounts rather than forage for the small handfuls found growing here and there in the lagoon. Other tanks down the row housed brine shrimp, copepods, different species of macroalgae and native microalgae used for shellfish "baby food." "So it looks like you're gearing towards being self-sufficient." "Right, it's what our grandparents were doing though they didn’t call it sustainable back then. It's just what they did which was smart and efficient and most practical." 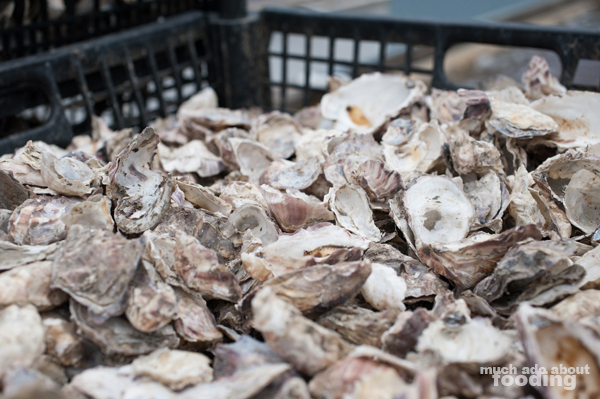 Not only are they growing the feed for their crops but they are also making use of the byproducts, particularly shellfish shells. We walked between towering trays marked with months and years, peeking at the conditions of each as Norman elaborated. Sat in the sun for 12-15 months until all the meat is gone, the shells are sun-bleached and cured. Afterwards, they are sold for landscaping and restoration projects. Take for example, the Department of the Navy who purchased them to restore habitats on an unused base. Prior to taking advantage of the farm's supply, shells were being shipped from the east coast at an unnecessary expense. The bird habitat they were restoring consisted of birds that only make nests from shells (the Least Tern being one of them) so this recycling was perfect. 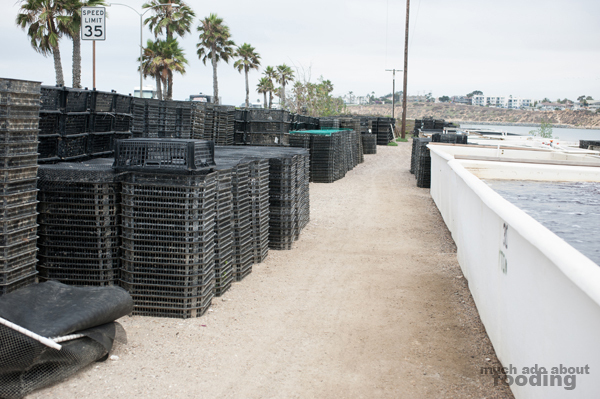 The Audobon Society and Cal State Fullerton have also taken advantage of the shells with the latter using it as substrate for a native oyster restoration project. One thing that we picked up on right away since Duc is growing his garden is the abundance of calcium for growing that ground shells can supply (and surprise surprise, a chef in San Clemente is actually purchasing the shells for that exact use for heirloom tomatoes!). [UPDATE: Part IV is available now.] This post is the third of four; Parts IV will be featured on the remaining Monday in September. Part I can be found here, and Part II here. Stay tuned for more information on this fascinating farm and its sustainable aquaculture practices. You can also visit www.carlsbadaquafarm.com! They are located at 4600 Carlsbad Boulevard, Carlsbad, CA 92018 but are unfortunately closed to the public. What's that mean for you, the shellfish-loving fiend? Catch them at one of the farmers' markets or take a step into one of the many restaurants they source to, like Slapfish!